Continuing with an update on some of this season’s orchid hunts, this post will focus on two of our less colourful species – the Frog orchid (Coeloglossum viride) and the Bog orchid (Hammarbya paludosa). Readers will be unsurprised to hear that, like most species described in the previous post, the Bog and the Frog have declined dramatically across their range over the last century. For the latter, this loss is particularly stark in Wales where only a few remnant populations remain in small patches of suitable pasture. For example, in Ceredigion (Mid Wales), the Frog orchid has dwindled to only one privately owned meadow near Llanfair Clydogau. Unfortunately, over the last two years I have surveyed the site, no plants were found and I suspect the species is now extinct in the county. 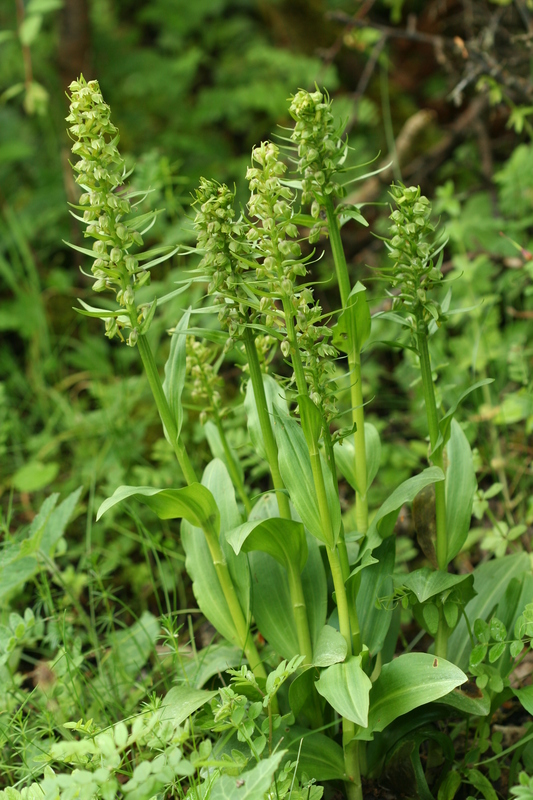 Recently however, a sizeable population of Frog orchids has been discovered in a disused limestone quarry in Denbighshire. Naturally I had to make a visit and so in late June I made the arduous journey to North Wales to see what I could find. Unusually, the Frog orchids I found growing in the quarry were not only huge (>35cm) but they grew in large clumps of up to 8 flowering spikes. Even stranger was the habitat – a hedgerow! Typically Frog orchids favour open calcareous grassland and scrub with plenty of light. We even found some plants growing inside an area of secondary woodland amongst leaf litter. Clearly the Frog orchid has a wider habitat tolerance than previously thought. Alongside the Frog orchids we came across large numbers of Common Twayblade (Neottia ovata), Common Spotted orchid (Dactylorhiza fuchsii) and Chalk Fragrant orchid (Gymnadenia conopsea). A gigantic multi-stemmed Frog orchid hiding in a hedgerow. Photo by Mike Waller. During the latter half of July, myself and the other trainees (Katy Potts, Sally Hyslop, Chloe Rose and Anthony Roach) joined lead Orchid Observers scientist Mark Spencer and AMC botanist Fred Rumsey for a couple of days of botanising and collecting on the local wet heaths. With the availability of a willing workforce, Fred took the opportunity to enlist our services to survey one of the few sites for Bog orchid not far from Studland. The Bog orchid is Britain’s smallest orchid species, usually standing no more than 8cm in height and entirely green making it very hard to find. Sadly, the species has declined by 61% with losses being particularly acute in lowland Britain where it is now only found in the New Forest, Dorset heaths and Cornwall. More recently, the Bog orchid has disappeared from Norfolk – the very last location for the species in the entirety of eastern England. Previous population counts at our target survey site appeared to be indicating a general decline from hundreds to a mere 18 flowering spikes seen in 2013. As with any localised population, it is vital that repeated surveying takes place in order to track environmental change. Of course, orchids are famously ephemeral in their appearance so flowering numbers are hard to predict. 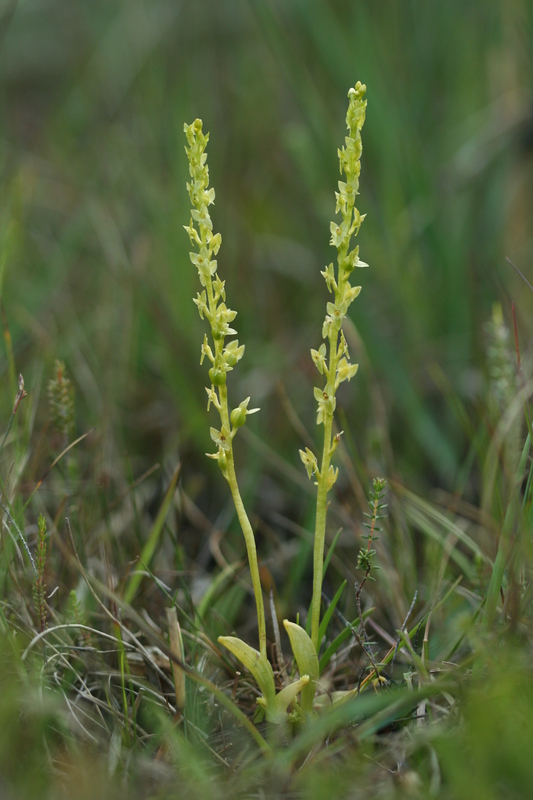 The Bog orchid is pale yellowish green all over making it difficult to spot. Photo by Mike Waller. After reaching the area, using specially drawn maps given to us by the county recorder, Mark and Fred quickly found 5 large plants at the edge of some rush tussocks and as we moved on, we gradually found more and more plants clinging to the mud amongst sundews and bladderworts. Fred methodically recorded each individual plant and its location as we combed the 100m stretch of sopping bog. By the end of the day, we waited in anticipation for Fred’s final count which stood at a fantastic 102 – far surpassing the previous count and suggesting that a decline was not necessarily occurring here. Let’s hope these fascinating little plants continue to thrive here for many more years to come. Don’t forget – now is the time to get out and look for our last orchid species of the year – the Autumn Lady’s-tresses (Spiranthes spiralis). Search for this species amongst short turf on limestone, chalk or fixed dunes. They can even be found on lawns and old grass tennis courts!